The Super 1 Day trip is a great choice for whitewater rafters during the 2019 high water season. You'll get the maximum rafting experience in a one day trip as you raft both the Upper and Lower sections of the South Fork American. This river trip is ideal for rugged paddlers since some of the rapids approach Class 4 levels at high water. This trip meets at 9:00AM at River Park Resort. The Upper Chili Bar section is an excellent whitewater run with over 10 major rapids. Its course will take you through the small mining town of Coloma, where James Marshall first discovered gold at Sutter's Mill and changed the course of California history. Calm sections are interspersed with wonderfully fun rapids, and the excitement comes to a head towards the end of this 8 mile section with a major rapid known as "Troublemaker". A chili dog lunch is served at River Park Resort which is almost the halfway point of the trip. After lunch, we run a 4 mile section of easy water known as the "Lotus Run". "Barking Dog Rapid" is a good place to watch expert kayaks testing their wave riding skills. 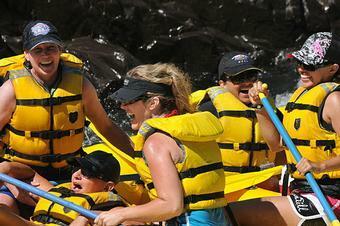 The famous Gorge section of the South Fork is the grande finale to this fabulous rafting trip. In the gorge, you will try surfing, rock splats and ramps- if your guide feels you still have the strength for it! Hospital Bar is a great place to "ride the bull" and a nice way to end your trip. This river is excellent for either the veteran or adventurous novices. The flows on the South Fork American River are the most dependable in the state, with guaranteed recreational releases for the next 50 years. 9:00AM - Check in for your trip. After check-in, we will depart for a 30 minute shuttle ride to the Upper Chili Bar put-in. Please make sure you have eaten breakfast and dressed in your river attire before you check-in. 9:30AM - After we arrive to put-in, your group will be given an orientation by our trip leader. Safety techniques and helpful hints are the main topics to be discussed. After the safety talk, we will suit you up with your pfds (personal flotation devices) and will hand out a paddle and helmet to each participant. 10:30AM - Rafts will launch. The action starts right away as we disappear around the bend and into several class 3 rapids. "Meatgrinder Rapid" is the longest class 3 rapid on the South Fork. 12:30PM - After we run "Troublemaker Rapid" and float through a scenic section known as Coloma Lake, we will stop for lunch at River Park Resort. 1:30PM - Lower Gorge section - Back on the river for a few more miles of relaxing water. We'll then enter the lower South Fork Gorge. This is one of the best sections of class 3 rapids in the West and is known for its many play spots. If you feel adventurous, ask your guide to show you some tricks! 5:00 PM - Takeout at Folsom Lake. Our shuttle bus will be waiting with a cooler full of cold refreshments when we arrive. After the gear is loaded, we'll board the shuttle for a 30 minute ride back to your car at River Park Resort. 5:30 PM - We arrive back to Lotus. You may view your photos and video of your trip and your journey down the fabulous South Fork of the American River! Driving Directions to River Park Resort: Our meeting place for all South Fork American River trips. Our resort (River Park Resort) is located in Coloma CA at the end of River Park Dr. (located just north of the highway 49/ South Fork American bridge). Driving from Sacramento: Take highway 50 east from Sacramento to the Ponderosa Road/ Shingle Springs exit - EXIT NUMBER 37. (You will be following signs to Coloma). At the end of the ramp, turn left, and go over the highway. There are two stoplights immediately after the overpass, take a right turn at the second stop light (North Shingle Road). Take North Shingle Road approx. 4 miles until it becomes Lotus Road. Take Lotus road until it stops at highway 49, turn left. Go over bridge and turn left on River Park Dr., there is a left-hand turning lane just after the bridge. There is also a Bakery here. Follow River Park drive to the left and into our resort. Our Resort is marked by a large brown "River Park Resort" and "Beyond Limits Adventures" sign. Driving from South shore Lake Tahoe: Take highway 50 west until Placerville. Take the highway 49 (Spring Street) exit, right, off of highway. Follow highway 49 north until you reach Coloma. At the left hand turning lane just past the highway 49 bridge over the river, turn left onto River Park Drive. There is a Pizza place and Lotus arts Studio here. Follow River Park Drive into our resort - River Park Resort. Driving from Reno or North Lake Tahoe: Take highway 80 west to Auburn. Take highway 49 south about 25 minutes to Coloma. This is a windy Road so take your time and closely follow the highway 49 signs so you stay on course. Just before you cross the main bridge over the river in Coloma turn right onto River Park Drive. Follow this into our resort - River Park Resort. Driving from San Francisco Bay Area: Take I-80 East to Sacramento, take highway 50 east and follow the directions from Sacramento above. Driving from Los Angeles or San Diego: Take I-5 North to Sacramento, take highway 50 east and follow the direction from Sacramento above. It is a good idea to arrive at least 15 minutes before your trip departure time to allow yourself time to check-in, use our restrooms and change into your river attire. Each trip has a designated departure time, make sure you know the time and plan to arrive before it. It is better to be early than late. We do not hold up trips for late arrivals. When is the best time of the year to raft the South Fork American River? California has rafting nearly year round but the most popular time to go is April through July for high water and maximum excitement. July through October still has plenty of action due to dam released water. Early season has great whitewater and we have discounts for April and May trips. Look here for information. Do I have to know how to swim well? Due to higher water levels this summer, we recommend all of our participants have basic swimming skills. If you are not a strong swimmer, consider booking your trip in mid to late August, when water levels will be lower again.. If you raft during high water (spring season) you will need a wetsuit whether you rent one from us or provide your own. Summer rafting on the South Fork American River does not require a wetsuit. Contact us if you have questions. You need to bring shorts, swim suit, t-shirt, foot protection (old tennis shoes, booties or sport sandals), and a dry set of clothes for your ride home. Everything that you wear will get wet so plan accordingly. Please do not bring valuable items (i.e. expensive clothes or shoes, jewelry, non-waterproof cameras or other items) on the raft. Under a wetsuit you will wear swimwear or insulated synthetic winter underwear (No COTTON) on cold spring days. On cold days wear wetsuit booties for extra warmth. For camping trips bring all the camping equipment you need (even the kitchen sink if required) since all of our 2 day trips operate from a base camp where you can drive in. We have lists of equipment recommended for all trips. Do not bring pets to any of our trips. All our meals are buffet style with plenty of non-meat items available to you. If you have other dietary restrictions please call us before your trip. How often do trips run? We run trips seven days a week from April through October. There are certain days in early and late season during the week that we may not have trips scheduled but can run a trip if you have at least 4 persons. Plan your trip as far in advance as possible and this will give you more options for trip dates if you have a group since most of our popular dates book well in advance. How many people go with each trip? During midweek we have smaller sized groups and the rivers are generally less crowded making the solitude of the trip much better than on weekends. On weekends we generally book out so we run the maximum group size that is listed for each river. Sundays are sometimes less crowded than Saturdays. Early and late season are less busy than prime season. We will run in any condition of weather or may give everyone the option to take a rain-check credit if the weather is extremely unpleasant at the check-in point. After April, the weather is usually perfect for rafting. Can we request a guide? If we have at least 2 weeks notice we will make every effort possible to schedule a guide that you enjoyed in the past. Is it appropriate to tip our guide after the trip? Although a tip is not expected, if you feel your guide has done an exceptional job or gone that extra step to make your trip more enjoyable and memorable, a tip is a nice way to show your appreciation. Can we still raft if we have young children (under 7 years)? Yes. On a two day trip on the South Fork American we can run a split trip where a different parent stays in camp during each day. We can also take kids as young as 5 on the Lotus section of the South Fork. Please do not bring pets. We had a group of 13 people rafting and camping and Beyond Limits was so accommodating. Most of the people had been rafting before but a few people hadn't and were a bit nervous. Each guide was great at making the trip as mellow or 'adventurous' to fit the different groups in the rafts. Everyone had a great time and people that had been rafting before with other outfitters said this one was the most fun. It was great to see both Scott and Chris, who had guided us previously a couple years ago. What set the trip apart was the campground and services available. There are flush toilets and hot showers available. The tent site was right by the river on a flat grassy area with swimming and some fishing available. Most impressively the dinner and hot breakfast were delicious. The staff literally work all day and most of the night to prep, guide, cook and clean. It took a lot of the hassle away that usually comes with organizing a group trip.